Intuitive, user friendly employee scheduling and resource scheduling software from Timewatch. Supports PCs, Macs, phones, tablets. 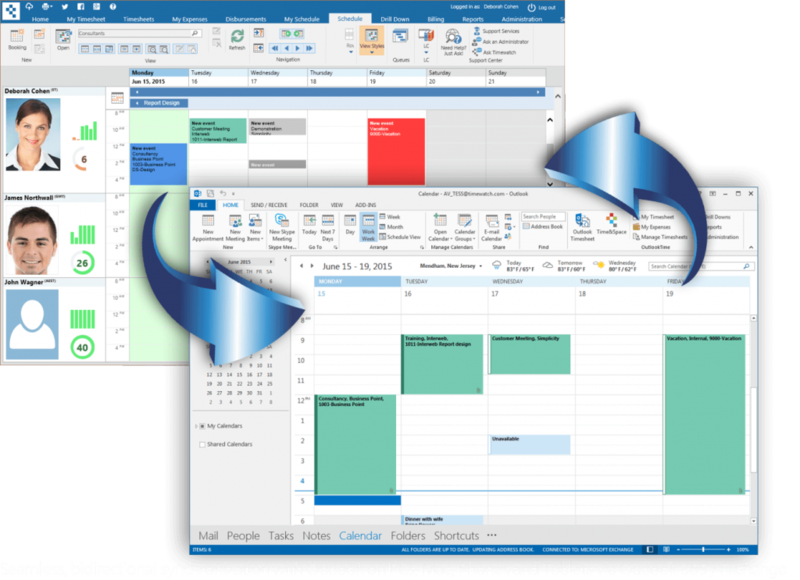 Supports bi-directional sync with Outlook, Outlook 365 and Google calendars. Schedule any type of resource. For example, employees, staff, consultants, equipment, rooms, training courses, engineers etc. Users can view their calendars from their iPhone, Android or Windows Phone or tablet. Available as a cloud resource scheduling solution, or on premises. See our outlook scheduling system for more details. It even supports outlook time tracking! and schedule resources quickly and easily. 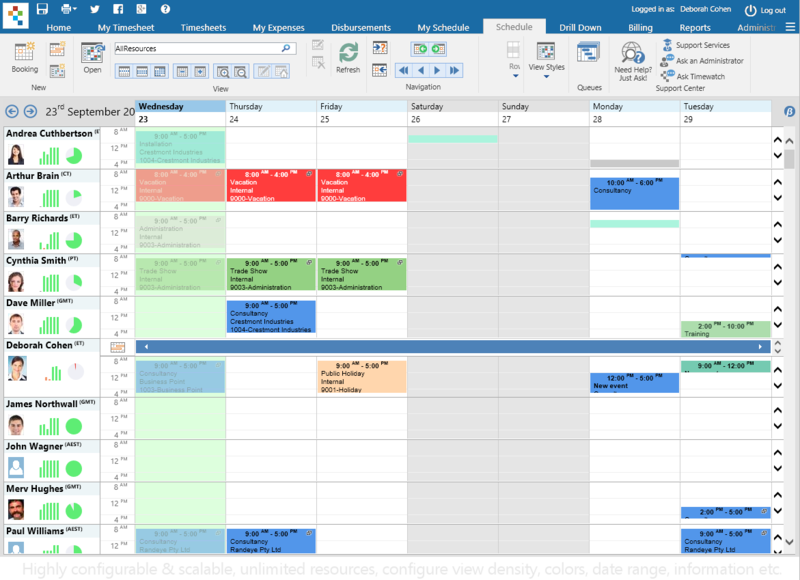 Scheduling with Excel, a Whiteboard or Paper? and Google sync updates their calendars for you. 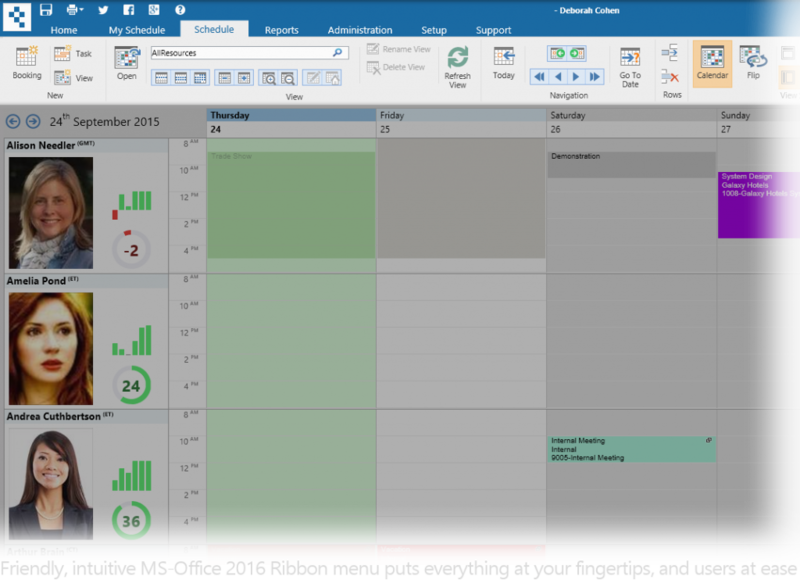 High visibility, high performance, highly scalable employee scheduling solution with seamless integration with Outlook and Google calendars. 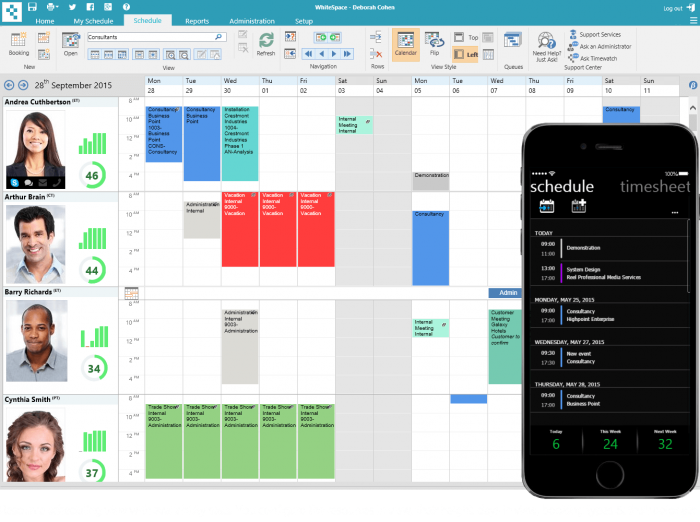 Schedulers can view multiple employees calendars simultaeously, color-coded booking types, see who is doing what & when and current and future availability. Intuitive MS-Outlook look and feel means no end user training. WhiteSpace is easy to learn, from the intuitive MS-Office menu that puts everything at users’ fingertips, to the built in Learning and Support Centers that provide free training, help, tips etc. there is also a built-in search engine that finds answers to your questions. Managing calendars is easy too: click and drag to create appointments, click or tap to edit, or drag and drop to move appointments. There is even a Scheduling Advisor that locates the best resource for a specific task based on skill and availability. No compromise, you configure the system to suit your needs: view resources, customers or projects; the zoom level; the number of days on display; booking colors; the data visible in bookings; mouseover tooltips; view style and much more. As each customer groups, sorts and arranges resources differently, WhiteSpace® allows you to define custom attributes such as: skills, skill levels, region, languages, degrees held – anything your organization needs to categorize your resources. This not only allows your users to sort, search and locate resources quickly and easily, it provides dynamic views that automatically adapt as you set resource attribute filters. WhiteSpace® if fully scalable, dynamic load technology means the system is just as fast with 10 resources as it is with 10 thousand. Outlook Sync on all Devices. Syncing with Outlook ensures everyone is on the same page so there are no surprises. Schedulers know that anything they schedule is published in users’ Outlook calendars on all devices, and they can see in the schedule anything users book in Outlook themselves. Additionally, our security model can be extended into Outlook to stop users from editing, deleting or moving appointments – something Outlook itself cannot even do. Outlook sync is completely seamless to users. There is nothing for users to install and it supports all Outlook clients on all devices via Exchange and Office 365. Watch the resource scheduling video for more details on the employee scheduling and planning features and functionality available. The Timewatch iPhone resource scheduling app is a beautiful fusion of employee and calendar scheduling and reporting that seamlessly links to Outlook and Office 365. Timewatch resource scheduling solutions also support iPad, Android tablets and Surface tablets. Our Time&Space solution combines scheduling with time recording to provide a complete Professional Services Automation solution. Advanced features include: a Scheduling Advisor that locates the best & most available resource for a job; a ‘Persistence’ system that ensures that when a resource is chosen for a specific attribute, the booking can only be moved to a resource of the same skill or attribute; and a conflict management system that allows you to control conflicts, allow some (for example provisional bookings) and help resolve them, restrict or stop conflicts completely. 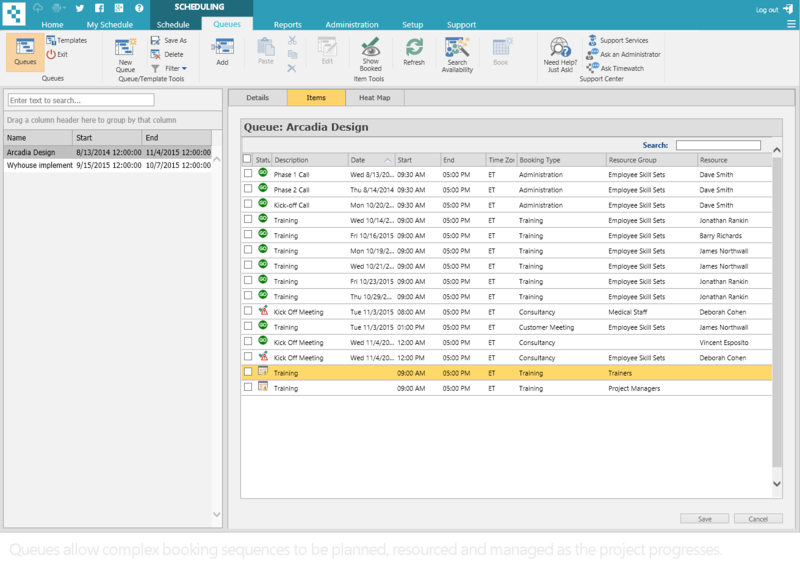 Optional modules include: Templates that can rerun common or complex booking sequences such as training courses; Queues that help schedulers plan and manage a sequence of Bookings; Customization and development options, and of course our Outlook sync system. Yes! You can start with one edition then move to another or add or remove optional modules at any time. In this way you can grow your Timewatch system as you grow your business. Yes, there are discounts for one-, two-, and three-year terms, volume discounts on the Enterprise range, and there are often promotions available that you may be eligible for. Contact us for details. No problem, we have other options. If you use Outlook / Office 365 / Exchange, we have a new product coming that enhances scheduling in Outlook. Contact us for details. If you need more power and flexibility, the next step up is our Time&Space® system which incorporates advanced timesheet facilities, expenses entry, cost and charge rating systems to value time and optional multi-currency and billing modules. If you have any questions about WhiteSpace® and how it can help your organization, please do not hesitate to ask.